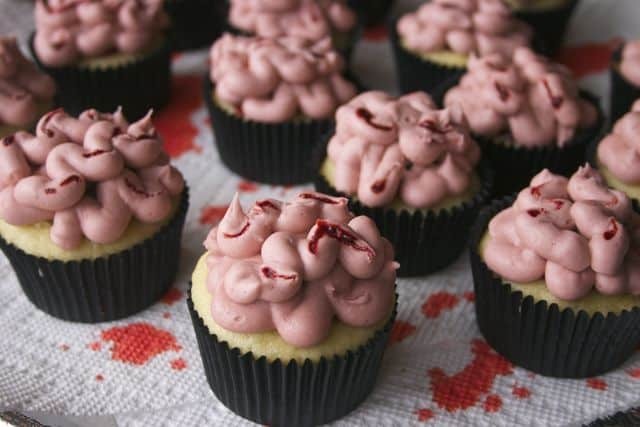 Bloody Brain Cupcakes – Happy Halloween! Happy Halloween! I’m sorry – more cupcakes! But these are fun, aren’t they? I first saw these cupcakes at Annie’s Eats. They were fairly easy to make – I used a simple yellow cake recipe, filled them with thickened cherry pie filling, and topped them with my classic buttercream frosting (tinted with red, black and brown food coloring). 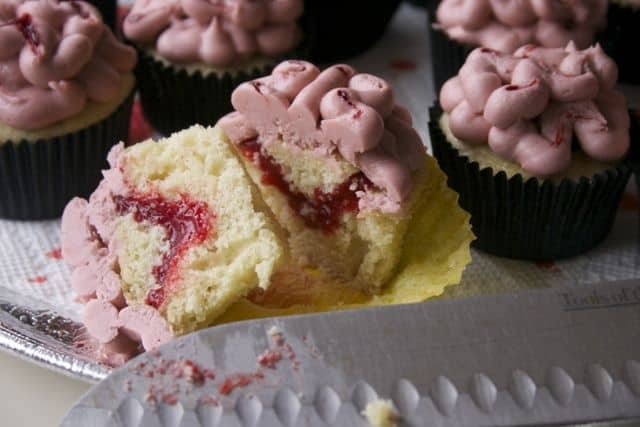 After piping the frosting in the brain pattern, you can also drag a bit of red food coloring in selected spots to simulate veins. A few important tips from Annie for piping the brain: (1) try to make the brain appear as though it has two sides (ie, hemispheres), (2) make both sides of the brain as symmetrical as possible, and (3) try to achieve a dome-like shape. For the cake recipe, see here. 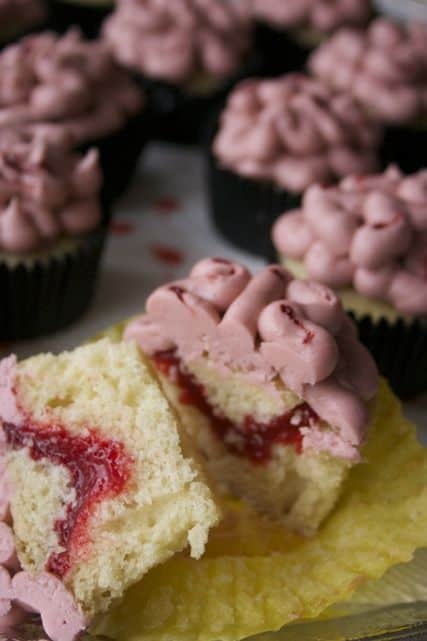 (This recipe makes a 9-inch cake, which can be used to make 12 to 18 cupcakes or you can double the recipe to make 24 to 36 cupcakes [please note that you will double everything except for the baking powder and baking soda]; also adjust cooking time to 16 to 20 minutes). For the buttercream, see here. (I used 6 cups of frosting for 24 cupcakes). For the filling, use one can of cherry pie filling, blend well in blender, and then thicken with cornstarch slurry. To make the slurry, mix 1 tablespoon of cornstarch with 1 tablespoon of cold water. Heat the blended cherry pie mixture over medium heat in a sauce pan and then add slurry in a very fine stream while whisking the mixture very briskly to avoid clumping. These cupcakes are adorable! I can’t wait to try them with my kids. So glad you are joining us around the family table for #SundaySupper!